The videos are gaining popularity especially on Instagram, as many users share their own process of making a drink at home. Searching “Home cafe” on the social media platform brings up more than 547,000 posts. Most pictures and videos focus on the users’ pouring skills and decorating style. Among the accounts, the most popular is “Som Som cafe,” run by 27-year-old Instagram user Park Sung-mi. Park has uploaded over 600 posts of drinks she has made at home so far. “I started to make those drinks at home as I couldn’t afford costly coffee from cafes anymore,” Park said in an email interview with The Korea Herald. In the distinctively shaped glasses, Park pours shots of coffee, milk, chocolate or green tea with a gentle and smooth motion. Then, she puts a scoop of ice cream on top. Other toppings vary from fresh fruit to chocolate chip cookies, depending on types and colors of the drink. Since Park started her “Home Cafe” in 2017, she has collected more than 30 cups of different shapes -- from round to triangular. She also bought a coffee machine and various ice cream scoops for making the drinks. “I wanted to share what I drink with others and stimulate viewers’ appetites,” she explained. Park said she films most of the videos on a gray table in her room from around 10 a.m. to noon. Then what’s the point of watching these videos? What’s made them so trendy? Many viewers say they feel comforted and satisfied just watching how the drinks are made. “That clinking sounds when milk is poured on the ice cubes -- it makes my ears feel so refreshed and comforted,” one user commented on a post. 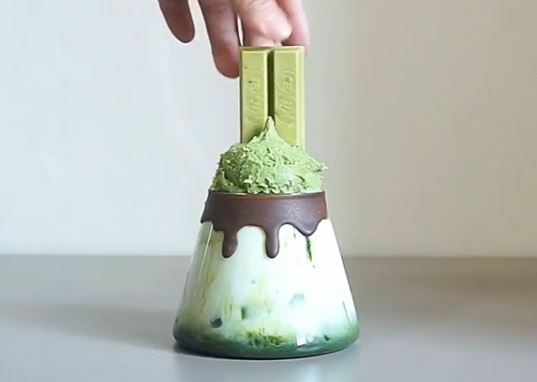 “When a shot of green tea blends in the milk, the colors are just so beautiful,” another user said in the comments. This weekend, why don’t you find a “small but certain happiness” by making a drink for yourself?